Secret Wars has ended, and the Marvel Universe has been reborn- better and brighter than ever before! 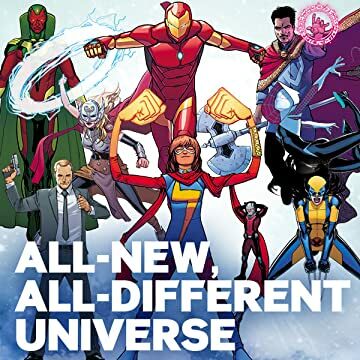 To celebrate, Marvel is proud to present this all-new, all-different guide to the Universe! 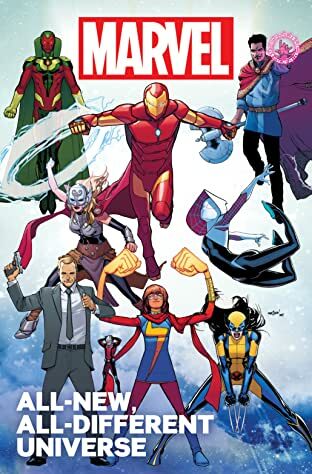 This edition includes brand-new profiles on Phil Coulson's Agents of S.H.I.E.L.D., Ms. Marvel (Khan), "Spider-Gwen" Stacy, Lash, Parker Industries, Singularity (A-Force), Ghost Rider (Reyes) and more! Plus updates on major characters starring in new titles: Iron Man (Stark), Ant-Man (Lang), Doctor Stephen Strange, the Inhumans, Thor (Foster) and Wolverine (Kinney)! Also featuring a global-sized entry for Doctor Doom's Secret Wars patchwork planet, Battleworld! Get in on the ground floor of the All-New, All-Different Marvel Universe which starts now!